Our Bespoke Guiding & Coaching is aimed at anyone who wishes to book exclusive time for either Coaching or Guiding, or a combination. You may wish for a 1:1 ratio, with your own Guide / Coach or you could book as a group of up to 6 friends. We can cover every aspect and level of sea kayaking, from beginner to advanced, from single to multiple days out. You may wish to bring your own equipment, if you have it, or use ours; it is entirely up to you. You will have the opportunity to try out a selection of different boats and paddles and can be sure our equipment is top of the range. When based from Glenuig Inn, we will head out each day to a different location so you are also able to explore the local area and go for some amazing journeys whilst learning skills relevant to your ability, progress and goals. Days start at 9:30 am and we return to our accommodation at Glenuig Inn at the end of the day where there are hot showers, a drying room and great food and drinks on offer! We also Coach at many other locations around the UK, so can travel to you (with our top of the range sea-kayaks and equipment) if required. Our Bespoke Guiding is designed for individuals or groups. You determine which of your friends (or none!) with whom you wish to share the journeys!! 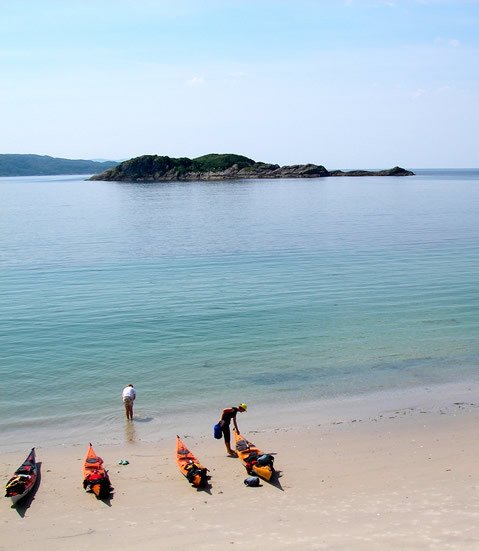 We have a series of discreet day trips sufficient for a whole week of sea-kayaking based at Glenuig Inn for you to enjoy. Days start at 9:30 am and we return to accommodation at Glenuig Inn at the end of the day where there are hot showers, a drying room and great food and drinks on offer! Or we can explore the Sound of Arisaig and Small Isles further with multi-day camping trips, when our days will be determined by the journey, sun, wind, waves and your group’s abilities and wishes; the options are many . . .
We also Guide outside of the Sound of Arisaig, both in the UK and abroad; please ask!